When creating an image histogram we need to go through all the pixels in the image. In larger images there can be a lot of pixels so this process can be slow if not programmed correctly. First time I used Qt and its QImage::pixel(x, y) function to access pixels in the image. It was very slow. It took more then one second to go through an image of size 4320 by 2868. One second waiting for a histogram to show is a long time and an user certainly wouldn't be pleased with it. 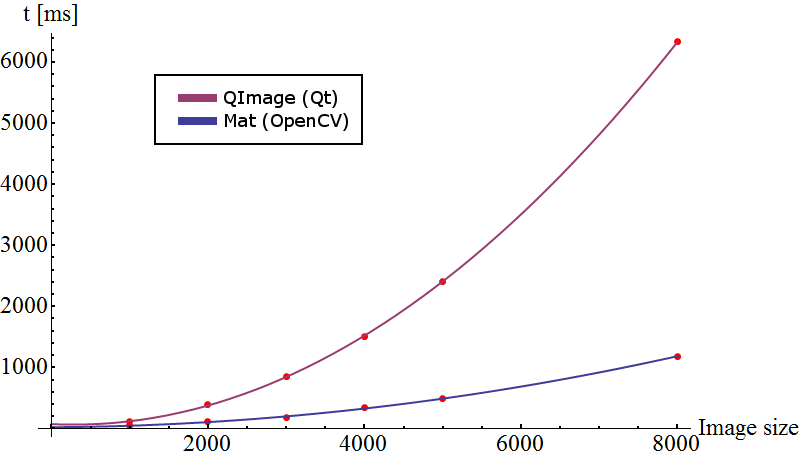 The alternative way is to use OpenCV and its class Mat which needed a quarter of a second. This is a pretty big difference and a big improvement in user experience. Bellow I've created a graph showing the time in milliseconds needed for calculating a histogram of a square image. The horizontal axes shows the number of pixels in one side of the image. 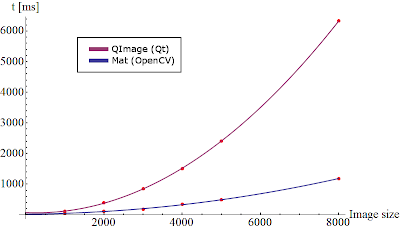 We can see that using Qt gives us larger calculation times. This is why I don't recommend it for image manipulations where we need to read or modify all the pixels in the image.